What have I been up to lately? Building my own electric guitar. William and Ashley both have Fender Stratocasters, and I have bought, then sold a couple different Gibsons to try to find something I like, spent quite a bit of time at Guitar Center playing various axes. Eventually I realized the Strat just seems perfect. Designed in the early 1950’s by Leo Fender, it is STILL the mainstay guitar of SO many successful musicians. The list of guys that consider(or considered) it their main guitar stretch from Buddy Holly, Eric Clapton, Jimi Hendrix, Frank Zappa, Red Hot Chili Peppers, Pink Floyd, to John Mayer and Kenny Wayne Shepherd. The Strat’s where it’s at. Rather than buy another of what we have, I decided to build my own from parts I selected myself. It’s still the same guitar, just a ‘custom’ version done exactly like I want. I started with an unfinished body mostly shaped and routed, then started searching for the neck and other bits and pieces I needed. William helped me with soldering, polishing, installing the tuners, and in general, being another set of hands and eyes to help be sure everthing was set right. Basically, it has become my obsession over the last couple months to get it finished. Of course, it took much longer than I thought, but I really couldn’t be happier with the result. I have a full picture gallery of the complete process here http://daveharperphotos.irun100s.com/GalleryList.aspx?gallery=95730 You can click each photo to read the description of what process I was working on, and also access full size photos. 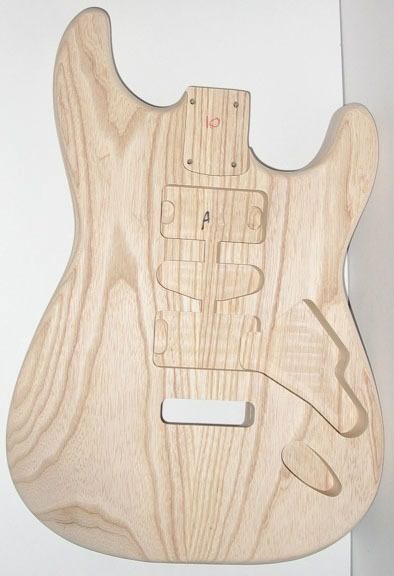 I used a Swamp Ash unfinished body. 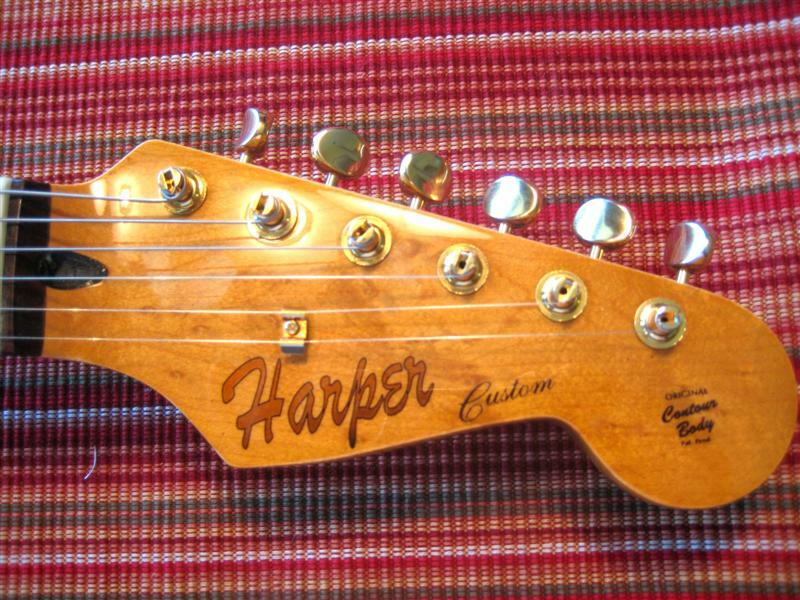 A birdseye maple neck, with rosewood fretboard. 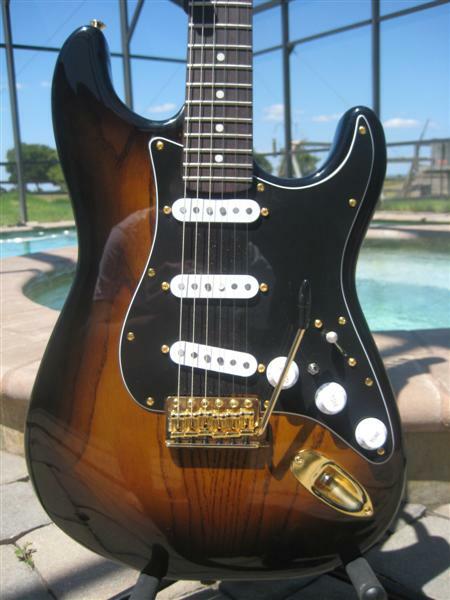 I wanted to build a pretty much vintage correct Strat, with my own upgrades as I saw fit. 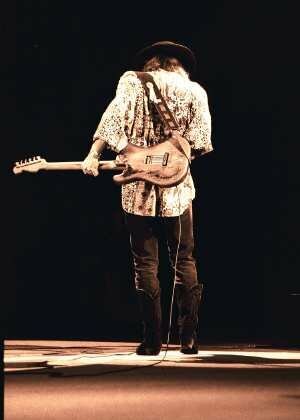 The basic inspiration was from Stevie Ray Vaughan’s Number One Strat(pictured at bottom of page), thought I obviously did not try to ‘copy’ that guitar, with the enhanced grain, different coloring, different wood, etc. that I used But I used vintage style tuners, tremolo, saddles, string tree, and real bone nut just as would have been on a 1950’s or 1960’s Strat. I did the contouring on the body to be similar to that era. An amber tint to the neck gives that older, vintage, yellowed vibe rather than the bright white maple of a brand new Fender. The decals on the headstock are Fender inspired, but my own take on them. I even stuck a small quote from Keith Richards of the Rolling Stones on there. 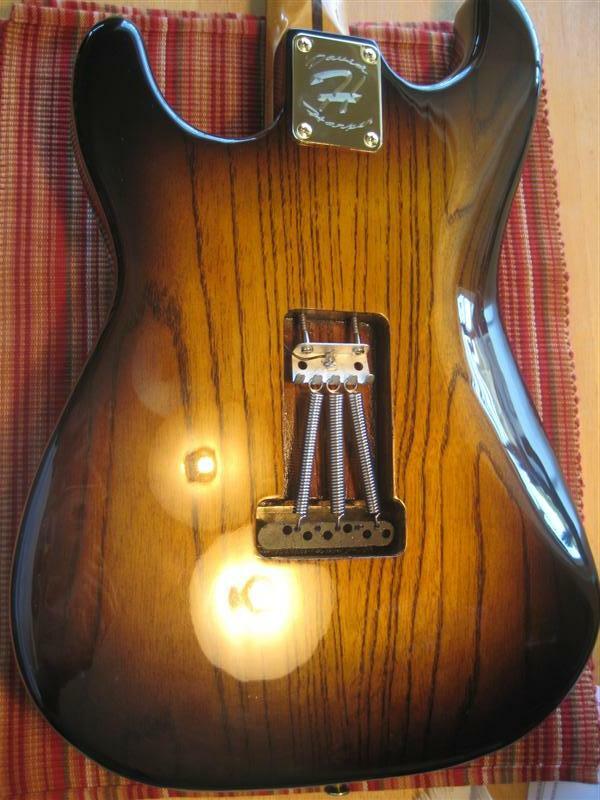 The finish is old school Nitro Lacquer, just as used back in the day. At one time used for automobile finishes, it’s too toxic for that use these days. I replaced the modern, cool abalone fret marker dots with cream colored clay dots, to also give a more vintage look. I think it came out pretty nice. It’s a joy to play, when I can wrestle it out of William’s hands. This is the body that I actually started with. Above is a copy of the actual Stevie Ray Vaughan guitar that was the starting point for what I was wanting to do. 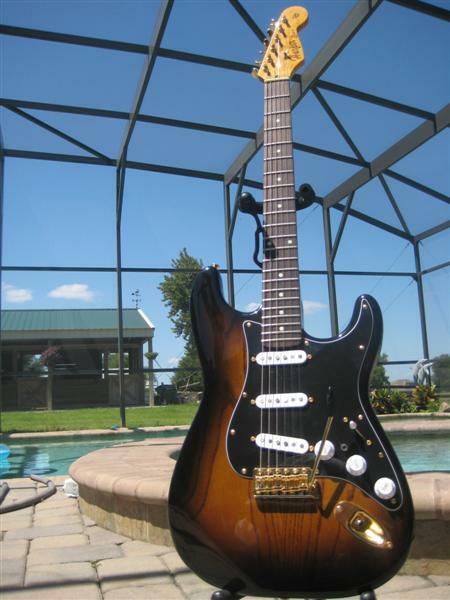 Below is a Fender replica guitar of the same. I wanted to do something like this, but actually build a better guitar than I might buy off the shelf, with my own twist on it. 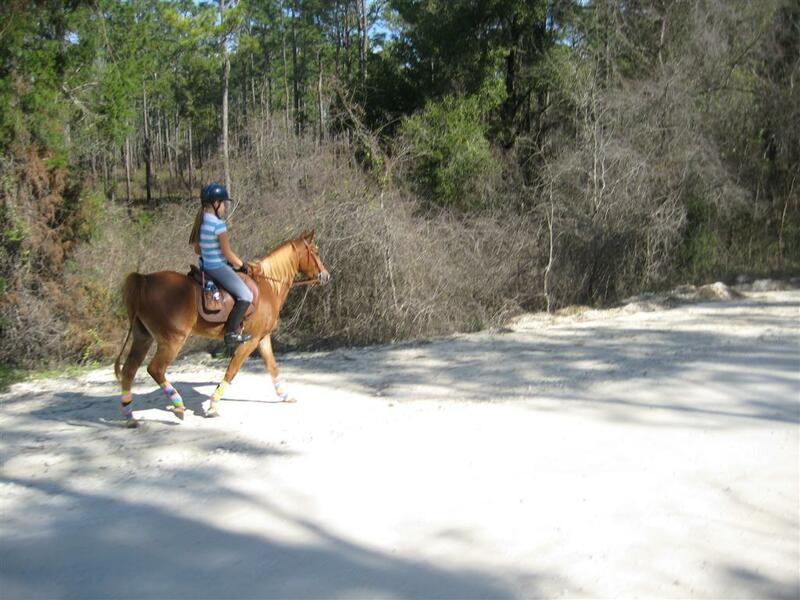 William and I did some riding this weekend. The day before, on Friday, I went riding with a buddy, DirtBikeMike. He had a pretty bad crash while following me. I had to go back and find him, he had gone down hard. Arm was very swollen, he’d had the breath knocked out of him, and his ribs were hurting. We could get his bike to start, but something was broke in the gearbox. SO, we had to leave his bike, and I had to ride him out of the woods on my bike, to get back to our trucks, went straight to get ice and ibuprofen. Then got as close as we could to his motorcycle with our trucks. It left me 1/2 mile by the GPS calculation for me to have to go in and push his bike out. Mike couldn’t do anything but sit in the truck. 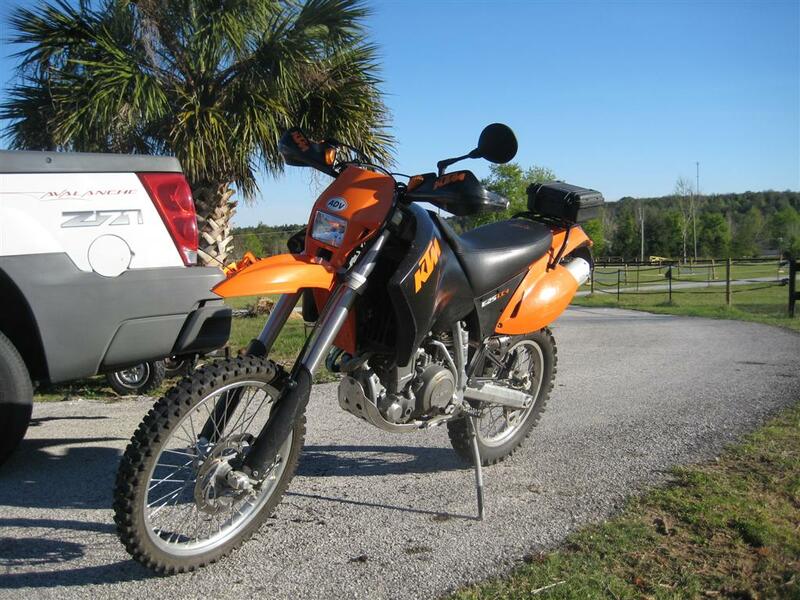 1/2 mile is a LONG way to push a 350 pound motorcycle on dirt trails! I ran in, and actually got out pretty quick, but that was certainly my workout for the day! Horses on Saturday, Motorcycles on Sunday. What could be better? 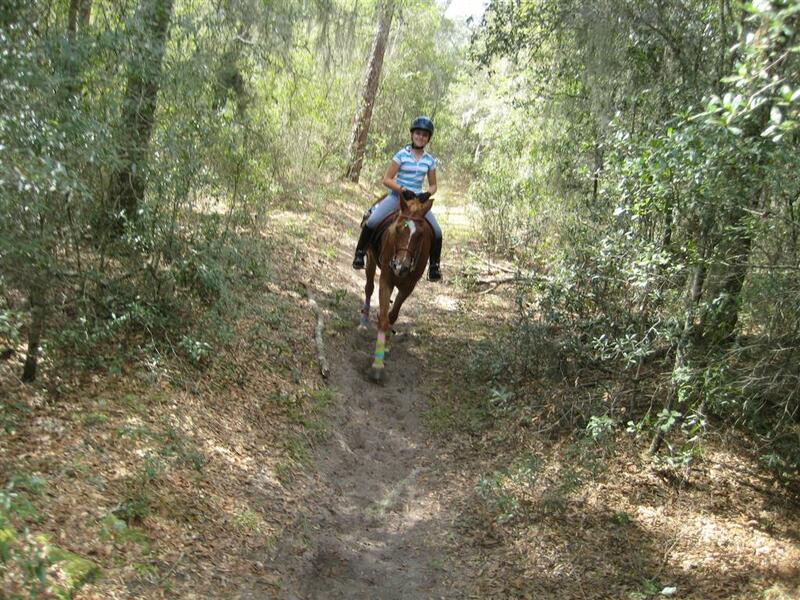 On Saturday, Ashley and I, took Reggie and Rocky to Croom for some trail riding. 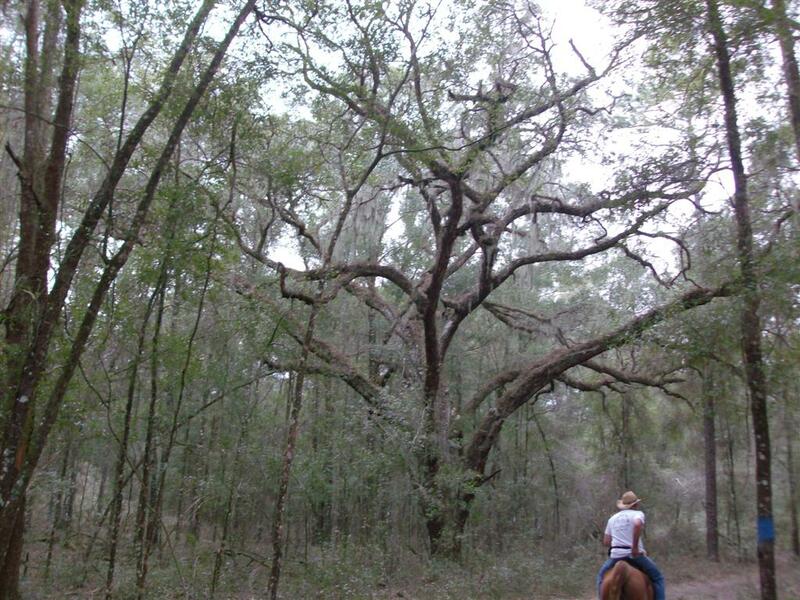 It’s a State Park about an hour from us, hundreds of acres of hiking, biking and horse trails. 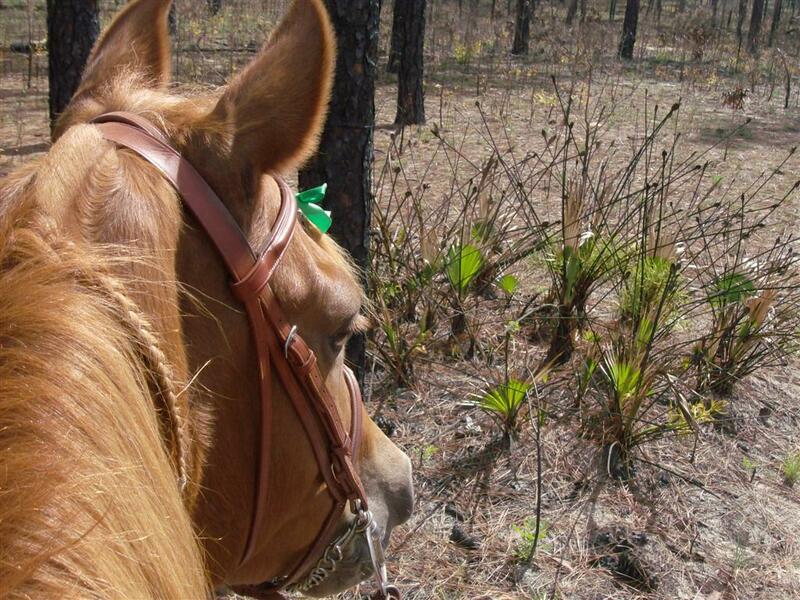 I’ve run hundreds and hundreds of training miles out there, now I’m starting to rack up miles on my horse. 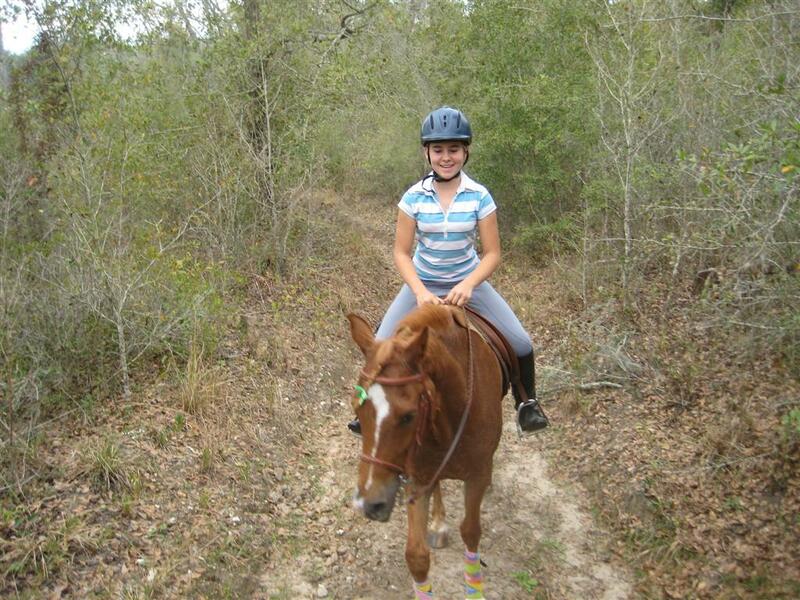 We ended up riding about 4 1/2 hours and had a great time. Covering a lot of ground that we’ve never seen, I was on Rocky FAR longer than I ever had been. We did quite a bit of trotting, and though I worried about overdoing it, he never acted like he was tired, and today, Sunday, he does not seem sore. 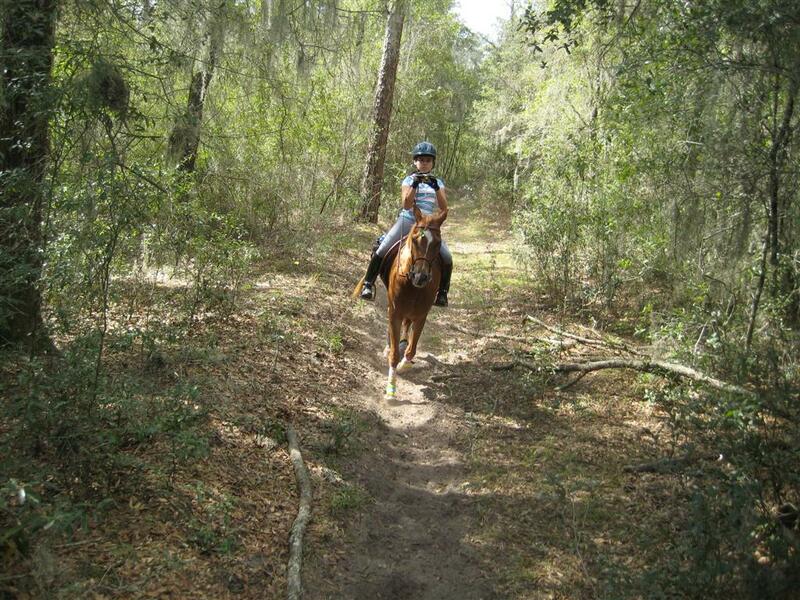 He truly seems to love the trails as much as I do, he’s curious, wants to see what’s around the next bend, hates to stop, and always wants to be moving, and moving quickly if I’ll let him. I’m lovin’ it. Ashley and I were both exhausted when we got back to the trailer. Here are some photos from our day, and a couple of videos. Click the thumbnails to see a larger photo, and click the link to see the video segments. 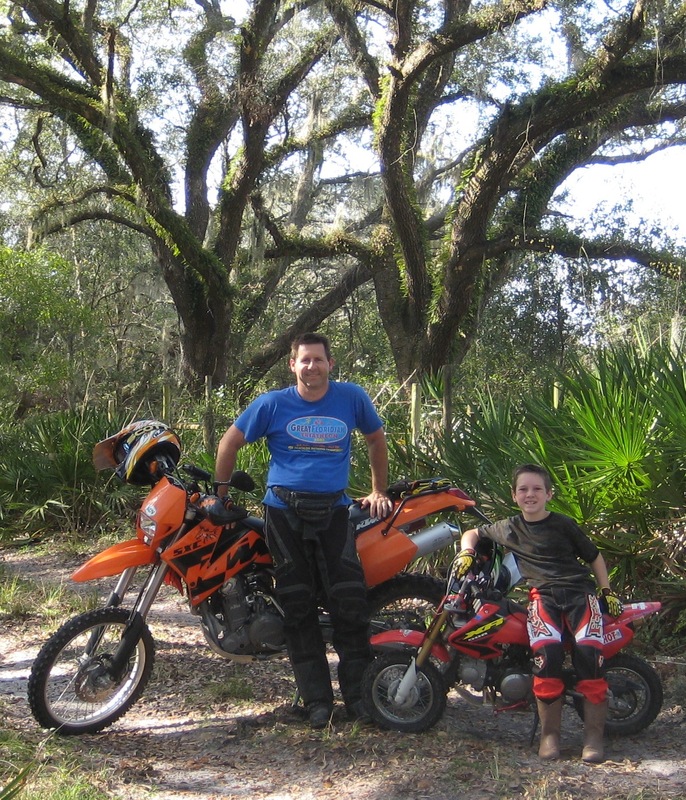 Then Sunday, I was to meet a buddy for some motorcycle riding in the dirt. He ended up not being able to make it, but I headed out to get dirty anyway. I hooked up with a couple of other riders on the trails, and not a mile after that, I ran out of gas(having to turn my tank to reserve.) That sent me heading out of the woods, back down the road to fill up. 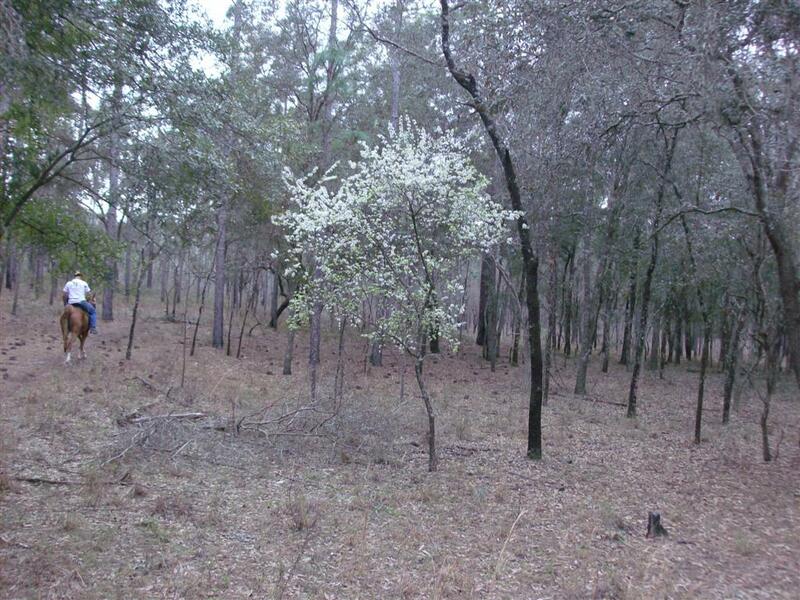 After that, I went exploring on many trails in the Withlocochee(sp?) 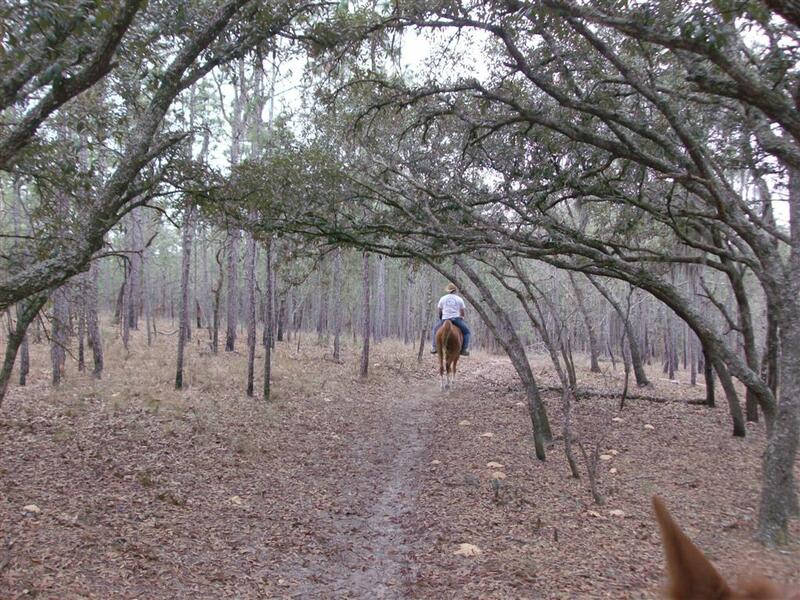 Forest that I’d never been on, and found and marked on my GPS a trailhead for some horse trails I’d also never seen before. Maybe a future trip for me and Ashley. Never crossed paths with any other motorcycle riders, but did see both wild turkeys and deer. I rode about 75 miles total, and was so busy riding I never stopped and took any pictures. Back home, safe and sound. Awesome weekend.